Punch has gotten a bad wrap over the last 80 years. Overworked and sickeningly sweet, simply throw every palatable liquid you can find into an oversized bowl, stir and top with a float of orange sherbet. Add the reputation punch has of only being served at teetotaling church functions or school dances, and the once revered centerpiece of any good Colonial-era house party was doomed to a lonely life in the corner between piles of cookies and port wine cheese balls. Punch is dead. Long live punch. That is until David Wondrich’s book Punch: The Delights and Dangers of the Flowing Bowl took up arms against the oppressors to champion its triumphant return. According to Wondrich, in its heyday, punch was served in taverns, homes and even churches. Ornate bowls were filled with Cognac, brandy, whiskey and Champagne with a little sugar and lemon to cut the alcohol. Sometimes fruit juices were added to provide sweetness. With the craft cocktail resurgence, it was only a matter of time before someone would discover the genius that was punch prior to the dark decades of Prohibition. A cup of good cheer from the flowing bowl is guaranteed to bestow upon its sipper an evening of merriment. Leave it to the South to lead the comeback charge with what has been described as a “killer of time” and “vanquisher of men,” which if consumed without care would leave even the heartiest of souls laid out. 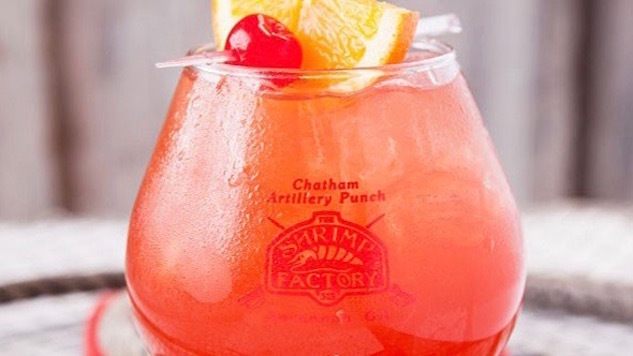 Chatham Artillery Punch is a punch straight from the history books, so named for the Savannah regiment it has stood watch over for 160 years. This historic concoction required a horse bucket full of booze to be stirred into a frenzy, destined to conquer whole rooms of blissfully unaware imbibers. It was no respecter of persons. No gun was needed. No cannon fired against coastal invasion. It was (is) Savannah’s most powerful weapon. No one is certain of what the original recipe contained or who actually devised the diabolical delight. Some say it was presented to George Washington upon his arrival at the Chatham Artillery in 1792 when he presented the esteemed regiment with two cannons. The more likely story is less reverent. After returning from a drill in Macon some time in the 1850s, the Republican Blues were welcomed back by Sergeant A.B. Luce and the Chatham Artillery. Luce concocted a punch using a horse bucket filled with finely crushed ice to which a quart of brandy, whiskey and rum were poured and lemon and sugar added. The bucket was filled with Champagne and stirred to “delirious deliciousness.” It’s said every man present that night was laid out. But when a group of Southern journalists held their convention in Savannah in 1870, Chatham Artillery Punch was catapulted from its isolated confines within the regiment’s headquarters to American legend. These journalists were treated to a riverboat cruise and served the devilish concoction. They too were laid out, and being men of journalistic integrity, reported back on their run-in with Savannah’s “mortal enemy of despair.” Everyone wagered a guess as to the actual contents of the punch, which in turn lead to some of the mixture’s more famous victims and ridiculous formulas. Some say it was made with gallons of Catawba wine and rum, while others called for maraschino cherries, Scotch and gin. Regardless of the recipe, the bowl was full of booze ready for the takedown. One famous victim, war hero, admiral George Dewey of the 1898 Battle of Manila Bay, surrendered to Chatham Artillery Punch upon a visit to Savannah in 1900. Horrified by this indignation of a national hero, journalists of the day chose to soften the blow to the American public by calling his drunken evening nothing more than a bout of indigestion from the mixture’s acids and a bad salad. So famous was the encounter, the recipe was named for Dewey. The punch in question was said to have contained two gallons of Catawba wine, one gallon of Santa Cruz rum, a half gallon of tea, six bottles of Champagne, three dozen lemons, three cans of sliced pineapples, six oranges, and a bottle of maraschino cherries. Bad salad, indeed. Needless to say the admiral recovered enough from his battle with the booze for the big parade the following day where he was greeted by 50,000 screaming fans and much cannon fire. Variations continued until just after Prohibition with guesses more like shots in the dark. One of the last published guesses was from the New York Sun in 1939 and included Catawba wine, rum, brandy, Benedictine, gin, rye and so much sugar your teeth might rot on the spot. The Chatham Artillery’s secret weapon has to this day never truly been revealed, and is a closely guarded secret held by its oldest member. Could this be America’s best weapon against tyranny—to lay low our enemies with Chatham Artillery Punch? Perhaps it is for you to decide. Try this recipe for the punch at home and let us know how you and your friends fare.